Cottage Charm - Peaceful Setting - Beautiful Bayou View & Retreat! This 3-bedroom/2 bath cottage has it all! Launch your boat from the nearby boat ramp and tie it off at the dock for some of the best fishing around. With everything you need here for your retreat, you may just want to stay in and cook from the fully-equipped kitchen or BBQ on the large deck. For cooler nights, warm up by the fireplace located in the open living/kitchen/dining room. Enjoy your morning cup of coffee on the screened porch, read your favorite book from the swing, fish right off the dock and take in the breathtaking sunsets in the evening. For your more adventurous side, explore the area, which in just a quick drive you'll find gulf beaches, the historic Old Town Bay St Louis with great restaurants and shops, and two casinos. And just an hour away, you can visit New Orleans. This home has all the conveniences you'll need for your stay, including a laundry. What more could you want? We chose this property because of the secluded location, incredible deck and screened in porch and the owners were great to sell it completely furnished, which they had made the perfect little cottage! 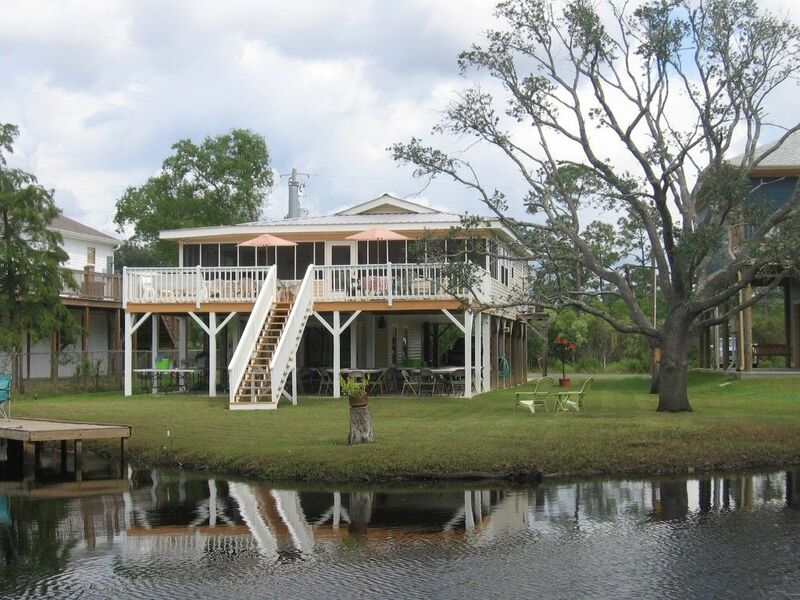 Unlike some of the other properties, this home is not on a canal so your view is not only of the beautiful bayou but of the marshland landscape that can't be beat! It's in a quiet neighborhood that provides the perfect setting for a relaxed retreat! Enjoy the beautiful view of the natural bayou right off the porch. Basic seasonings and items including coffee and tea provided. Basic glassware, dinnerware, cookware and utensils provided. Inside dining for 8-9 and outside dining for 8. Very large deck with plenty of room for entertaining. The house had everything we needed or wanted. Very clean beautiful vacation home. Owners even brought over gear for us to have our own crawfish boils while there. Can’t wait to visit again. Second time we stayed here. Just the two of us. Great view off the deck. Close to Bay St Louis. Quiet neighborhood. Clean. The house is adorable but a tad cozy. Since it was just the 2 of us that was no problem. We loved the screened in porch with the swing and the rocker. Even though it was cloudy, rainy and foggy the week we were there, we still enjoyed the porch and the deck. It was fun watching the water level go up and down by the steps on the dock. The house is easy access to New Orleans and to the Gulf Coast. We enjoyed exploring the area. This was our first trip to Mississippi and we enjoyed it immensely. I could see us returning to this cozy retreat. First experience, easy to .Property was as advertised. Very clean with a coastal vacation decor. First experience, easy to book. Property was as advertised. Very clean with a coastal vacation decor. Easy to communicate with owner. We would use Home Away again to book our next vacation. Quite, natural area close to Coast. Go out to eat or stay in and cook. Easy place to enjoy. Truly enjoyed our stay at the cottage. Just as advertised - charming and peaceful. Well equipped kitchen and comfortable beds. Jody was prompt with all inquiries. We all enjoyed the inviting screened in porch for our morning coffee, and my husband enjoyed trying his hand at catching blue crabs. We found this a great location for our itinerary: 1 hour to NOLA, 30min to several swamp tours, 1.5 hrs to plantation tours, 1 hr to Biloxi on scenic drive along Gulf coast, 1.5 hrs to Mobile. Easy access to grocery stores, fast food, cute Bay St Louis waterfront shops/restaurants. Thank you Jody! Enjoy some of the world's best fishing and boating. Relax in the peaceful setting of one of Mississippi's most beautiful, natural bayous. Or experience the nightlife of local casinos and the New Orleans French Quarter. You can have it all in our Bayou "LaVie" Retreat. Check out the shops and dining in Old Town Bay St. Louis. Fish or crab right off the dock or bring your boat to launch in a nearby boat ramp into some of the best fresh water, salt water or in-between fishing.